Complex products and long buying cycles make search engine optimization for B2B sites different than for B2C. The difference, however, is not in the specific techniques, but in the way SEO and other marketing tactics are integrated to help a B2B ecommerce company perform well in search engines. For B2C, SEO can perform as a standalone channel. But for B2B it is part of several marketing tactics working together. “If you look at the SEO side of this, the fundamentals are all just exactly the same” as those for business-to-consumer SEO, said Jon Quinton, CEO of Overdrive Digital, a marketing firm, during a November 2016 SEMrush webinar. Even seemingly mundane products can be relatively more complex to find, choose, and manage in the B2B channel. For example, imagine a brick-and-mortar cowboy boot retailer with 20 stores in the Western United States. The company wants to order custom shopping bags for its stores, but it cannot just go out and order the first bags it finds. The retailer will need to select finishes like matte, gloss, foil, or laminate; choose printing techniques; and even decide whether the extra $432 in setup fees each time it orders is worth it for two-sided printing. It will also be important to know the supplier’s lead times are and how much the bags will cost. 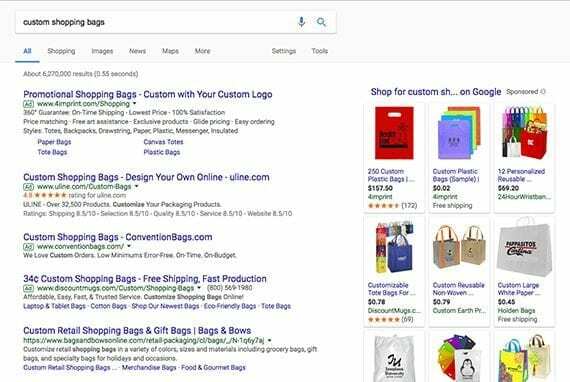 This level of complexity can make it difficult to simply search for shopping bags on Google and find a good source in even the top 20 or more results. The B2B purchase process may require a consensus of several individuals. Let’s continue with the example of a cowboy boot retailer looking online for custom printed shopping bags. Unless the retail business is very small, it is likely that at least four individuals or groups will be involved in the buying decision. Next, there will likely be a graphic designer who will want input on bag color, material, logo options, and graphic layout. A brand manager, art director, or marketing director will need to approve everything the graphic designer selected, and someone from the operations group will weigh in on whether or not the bags are feasible. Will they hold large boot boxes? Do they fit under the counters? Along the way, each of these folks will presumably go to Google or Bing and search for shopping bags. None of them will use the same exact keyword phrase. Given the complexity of options and the number of folks involved, don’t be surprised if it takes weeks for a B2B buyer to actually make a purchase, even when she is just buying shopping bags. To be fair, this shopping bag example is hypothetical. Some B2B ecommerce purchases will be fast and easy. But others might be even more complex than shopping bags. These complex purchases are going to require more work than simply attracting someone’s attention for a single query or a couple of keywords. What’s more, some B2B searches are dominated by third parties. “There was a time when ranking number one for a keyword was a victory wholly worth pursuing — a time when you could build a list of keywords, craft 300-word blog posts, and your site would drive new business. That is no longer the case,” wrote Directive Consulting CEO, Garrett Mehrguth. Thus B2B ecommerce SEO may work best when it is integrated with the disciplines of search engine advertising, public relations, and content marketing. The goal is not to simply rank for a single keyword or even a group of keywords, but to surround those keywords with your brand. This can take a few forms. Search engine advertising. Purchase pay-per-click ads for the keywords your B2B ecommerce business is targeting for organic SEO. If you win the organic ranking, great. If not, you can still show the assistant, graphic designer, brand manager, and operations manager your products — no matter where they happen to be in the buying cycle. Also, use retargeting to follow B2B buyers. Notice in this screen capture from Google for search results for “custom shopping bags” that some of the companies are buying multiple pay-per-click ads on the page. Encourage reviews. Public relations and influencer marketing may help your B2B products earn reviews on popular sites. A third-party article describing how your custom shopping bags improved customer loyalty may appear much higher in search results than your own content and can still contribute to your sales. Develop content for the entire buying process. Create useful articles and videos to address questions your prospects will have at each phrase of the buying cycle. This means helping the assistant who does the initial research organize options, helping the graphic designer, and even providing information for the folks in operations. Ultimately, B2B ecommerce SEO may work best when you supplement your organic keywords with ads, influencers, and content.